-JdK- Last August, Martin contacted Juris for an original 1920s Norton ‘compression tap’ which is illustrated in the 1921 sales catalogue. Juris did indeed possess such a thing and lent it to Martin so he could make an accurate copy for his belt drive Model 9. Martin: "It’s not hard to understand why it wasn’t made for very long, as it’s a very complex solution to a simple problem. I wondered if other vintage Norton enthusiasts would like to get one. These will not be cheap as they are made from unplated high grade steel like the sample. Anyone interested in obtaining one should contact me via this website. They are going to cost about £100 including UK postage, and more for overseas destinations." 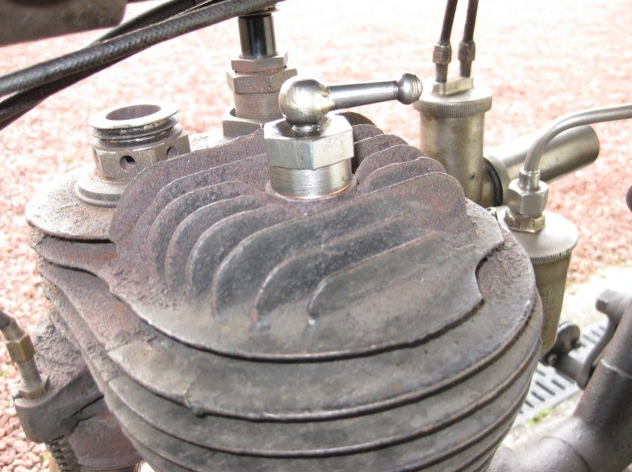 Dave Moffat has fitted one of the replica taps to his Model 9 and he reports that it only needs half a turn open for the bike to push along easily. No need to remove the belt or hold the valve lifter open. The photo above shows one of the taps installed in his Model 9.